Aim of the present study was to evaluate the clinical performance of direct and indirect composite restorations in endodontically treated posterior teeth for an observation period of 6 months. The study included 65 patients and 126 composite resin restorations - 41 direct (SDR, Ceram X Mono/ Dentsply) and 85 onlays (In:Joy, Dentsply). At baseline and at 6 months they were evaluated using modified USPHS - criteria. Statistical analysis was performed using the Pearson Chi square test and SPSS v.19. There was no statistically significant difference between the results obtained at baseline and after 6 months for both materials (P>.05) The direct and indirect composites demonstrated excellent and promising clinical performance in endodontically treated posterior teeth over evaluation period of 6 months. Nicheva S, Filipov I. RESTORATION OF ENDODONTICALLY TREATED POSTERIOR TEETH WITH DIRECT AND INDIRECT COMPOSITE – 6-MONTH RESULTS. J of IMAB. 2013; 19(4):396-400. doi: 10.5272/jimab.2013194.396. 1. Wagnild G, Muller K. Restoration of endodontically treated teeth. In: Cohen S, Hargreaves KM, eds. Pathways of the pulp. 9th ed. St Louis: Mosby Co, 2006: 786–821. 3. Kishen А. Mechanisms and risk factors for fracture predilection in endodontically treated teeth. Endod Top. 2006;13:57–83. 4. 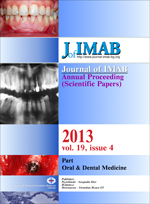 Yamada Y, Tsubota Y, Fukushima S. Effect of restoration method on fracture resistance of endodontically treated maxillary premolars. Int J Prosthodont. 2004; 17:94–8. 16. Mittal N, Sajjan GS. Fracture Resistance Of Endodontically Treated Premolars By Various Restorative Materials - An In vitro Study. Ind J Den Sci. 2010; 2(6):1-5. 17. Plotino G, Buono L, Grande NM, Lamorgese V, Somma F. Fracture resistance of endodontically treated molars restored with extensive composite resin restorations. J Prosthet Dent. 2008 Mar;99(3):225-32. [PubMed] [CrossRef].